Joy Creek Photo Archive (c) all rights reserved Found in moist meadows or along streamsides in its native setting, Primula burmanica is a Candelabra type primrose with big cabbage-like leaves more than 10 inches long and 2 to 3 inches wide. The leaves are mostly deciduous in our garden although the literature suggests that they can be evergreen. Individual flowers consist of a tube with expanded petals. A bright yellow eye lights up their interiors. The flowers are arranged in 3 to 6 whorls on a stem with up to 18 flowers per whorl. 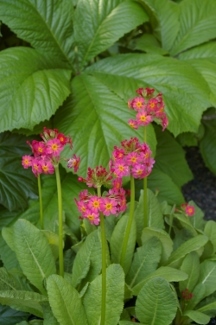 In other words, this is a showy primrose. May, June. 24 in. x 24 in.